Parents Are TIRED of Unhealthy Food When They Take Their Family on Vacation! Even when people are traveling they still want to eat healthy away from home. In fact, it can be tiring eating out at all the restaurants and picking up convenience store food on the go. They'll start wishing they had ideas of how to be healthier on the road. There are so many calories and so much fat in foods you get on the go. Show your audience how to pick healthy options when faced with the never ending unhealthy food when on the road. This pack isn't just about traveling with a family. There are tons of niches that you can cater to with this PLR. People who drive trucks look for alternatives to always going to the truck stop and picking up the fatty foods that those restaurants serve. They are looking for healthy alternatives that they can pack in their truck. It is tiring trying to figure out what food to buy next. Take the guess work out with this bundle. Plus eating out every single day can get expensive. Or what about people who have jobs that require them to travel? They want to know how to eat healthy while they are working on the road and what to buy quickly when they've got to get to the next destination. People who work on the road, go on family vacations or live in a truck (or RV) still want to be healthy. Ten 450+ word articles are included in this bundle. 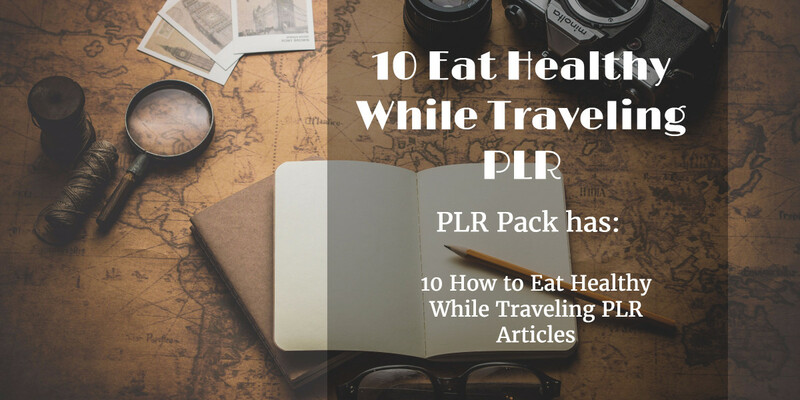 In this pack you’ll get articles on How to Eat Healthy While Traveling. You’ll be able to help your community make better food choices when they are traveling. 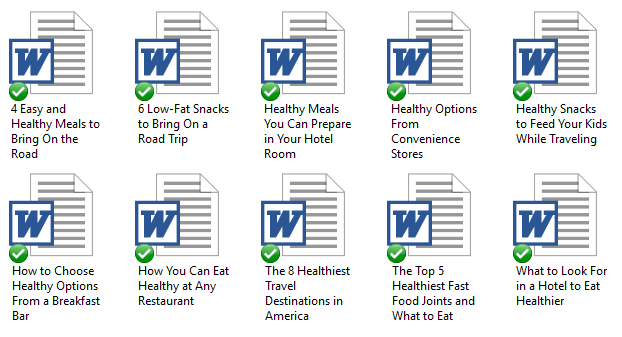 I’ve come up with 200 long tail keywords all related to eating healthy while traveling. You’ll find some of these are what people like to call low-hanging fruit keywords while others have more searches.